Bespoke uniforms for male and female flight attendants to enhance your flight crew appearance. International giants Qatar Airways and Icelandair dress their cabin crew in solutions supplied by Olino. Look, fits and fabric differ from uniform to uniform, as every airline requires a clothing package tailored to their individual guidelines, brand look and preferences. Inspired by the wild Icelandic nature, Icelandair match ruffled shirts and dresses with retro-style jacket to create a signature look, whereas Qatar Airways highlight their culture in one of the most known uniforms across the globe. 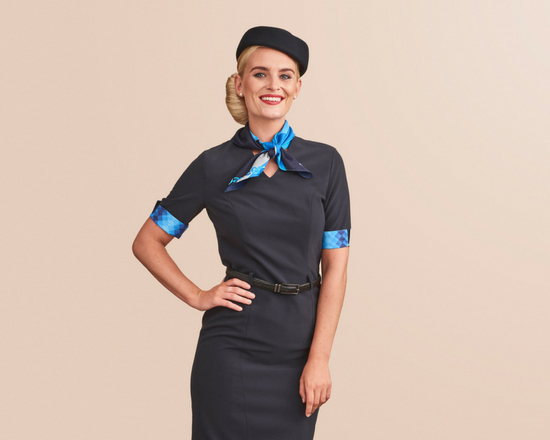 Flight attendants are the face of a carrier and we are a proud supplier of cabin crew uniforms that highlight our experience, workmanship and eye for an impeccable look. Our design team will assist in you in creating your desired look, from design sketches and prototyping to onsite fitting. We provide a tried and tested setup perfected to meet the clothing needs of flight attendants. We bring your designs to life by turning your sketches into custom uniforms featuring the fits, details and colors you desire. We also carry a range of ready-to-wear garments easily matched with bespoke clothing items to create a cost-effective yet individual uniform program. Benefits include reduced stock risk and production time.